in the end-design and/or the actual construction of our Tiny House. For the most accurate and up-to-date information please refer to our eBook. I have a neat story to tell about the tiny wood stove we purchased to go in our tiny house and the system we have been devising to heat our living space and make hot water at the same time. It’s a tale that relies on characters from four countries and three separate continents, the internet, and the generosity of someone we’ve never met. It is rooted in innovation and DIY ingenuity, and it just might produce all of the heat and hot water that we’ll need for free. This is part 1 of 2 posts focusing on Wood Heat & Hot Water. The house I grew up in is heated by wood, the raw material of which – apart from the gasoline and oil used to power a chainsaw, tractor and splitter and their associated wear and tear (and deferred carbon cost) – is essentially free, coming as it does from old family land. Since moving out on my own, however, I’ve never once had the chance to heat with wood; which is too bad, since it makes for wonderful heat. In an age of natural gas mined using dangerous and toxic fracking, Gulf Oil spills displaying the dangers of open water drilling, the overarching threat of peak oil and the daunting Hubbert’s Peak staring us in the face, wood is primed to make a come back (albeit for largely less principled reasons). Problem is that wood as a fuel source has a serious drawback. One only need peer back in time before the advent of oil, or examine most any part of the world where presently wood is the primary fuel used for cooking, to identify what it is. Of course, I elude here to places like the British Isles or the Middle East, where, relatively speaking, there’s hardly a branch left following the inhabitants’ voracious pre-oil-age appetite. In many communities in various countries in Africa or other parts of the majority world, women have to walk miles every day just to find the twiggy tailings of drastically shrinking forests. Deforestation is a real threat in a post-oil world unless, perhaps, we apply a little restraint and a smidgen of technology. Step One: live in a 200 square foot house (if you count the loft); after all, that’s not a lot of space to heat. Step Two: insulate and seal our tiny house as much as possible, within the limitations of windows, the 2X4 walls and, in our case, dimensional 2X6 everything else. Step Three: install a super-low-flow shower head (.5 GPM!) and super low flow faucet aerators (.375 GPM!) and a Nature’s Head waterless toilet to minimize our water usage. Step Four: rely almost exclusively on a pressure cooker to cook with since it uses a lot less water then a regular pot. We use a Kuhn Rikon model, which is amazing. Step Five: install a wood stove so small it can be fired with twigs, driftwood or storm-drops, discarded untreated/unfinished fencing, siding and decking or even detritus from a carpentry project, construction site or tree trimming operation (again untreated/unfinished/dry). Like many, we’ve been enamored with the tiny marine stoves produced by Navigator Stove Works. Enamored, yes, but not so pleased with the hefty associated price tag ($1385 starting price). Resorting to the internet, I searched for a used or unwanted model. And searched. And searched. Weeks went by. 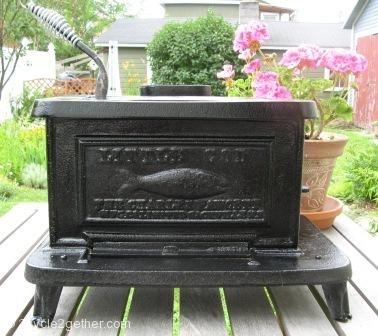 Then, one day, I came upon a Kijiji listing advertising an old Little Cod wood stove. The best part was the price: $150 CAD! There was a nice picture but something didn’t look quite right. 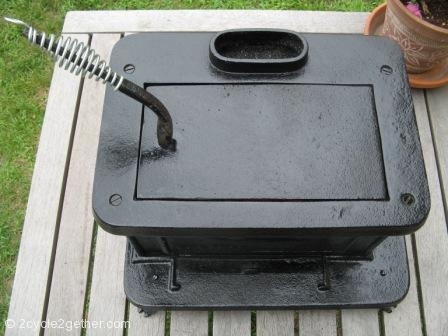 So, I did a little more research and discovered that back in the day there were a host of foundries usually located in ports and/or fishing communities that produced copy-cat marine wood stoves as well as their own regional varieties. I came to understand that the Little Cod in the ad was originally made in New Brunswick, Canada. I next got in touch with the seller, a very sweet senior living in western Nova Scotia. During our telephone conversation he balked when I stated that we were planning to usethe stove he was selling. His response reminded me why it’s not always a good idea to buy an old, used cast-iron wood stove. In disbelief, he said, “You can’t actually use this stove! It’s just for show. People put these old things in their parlors just to look at, as a reminder of the bygone fishing boat days.” In translation: ‘the cast iron is old and brittle, probably cracked in fourteen places, and I wouldn’t trust it in my own house, let alone yours.’ But then, he let slip a nugget worth its weight in gold. 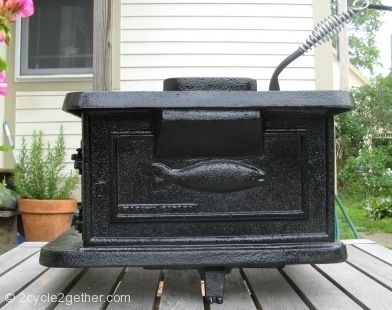 “You know, the foundry up in Sackville, New Brunswick [the Enterprise Fawcett Manufacturing Company, an earlier iteration of which was cast into the front of the stove he had for sale] still makes these Little Cod wood stoves.” What?!?! As soon as we hung up I checked the internet to find the telephone number to the foundry. I dialed it, the phone rang and a very nice woman answered the other end. 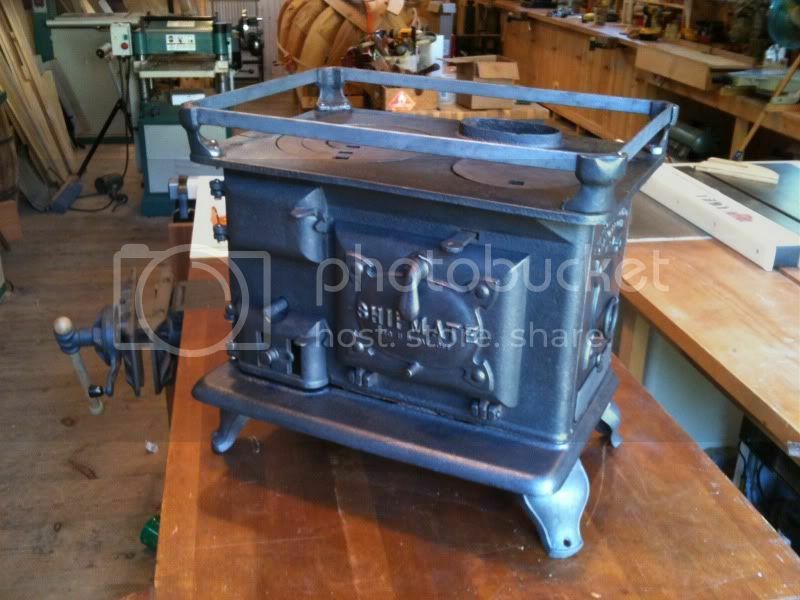 “Rumor has it you still produce the Little Cod wood stove,” I blurted. I was almost too afraid to press on. After all, who would still manufacture something, yet oddly make no mention of it for sale on their website? And how had I broken this story? To this day there is nothing on the internet that points in this direction, despite many tiny house and boat owners forums discussing wood heating options to exhaustion. What could they possibly charge for something no one even knows they make? I gulped. That’s around $380 USD. Amazing. The rest of this story is rather bland, comprised as it is of finding a local dealer (Enterprise Fawcett will ask you to work with a dealer to buy the stove), ordering the stove, then picking it up when it arrived. Oh, except for the fact that I am still amazed it showed up in one piece, given that it made the trip “nestled” amongst several issues of shredded newspapers in a torn and ripped and reused, single-walled cardboard toilet paper box. The package honestly looked like it had fallen off the back of the truck repeatedly, and then, somewhere in northern Quebec, the driver, too weak to pick it up and re-stow it for the twelfth time, instead wrapped a rope around it, and dragged it the rest of the way across the border. Amazingly, there was no damage. I guess the warning message displayed by the plethora of “Fragile” stickers covering the outside of the box was actually heeded. 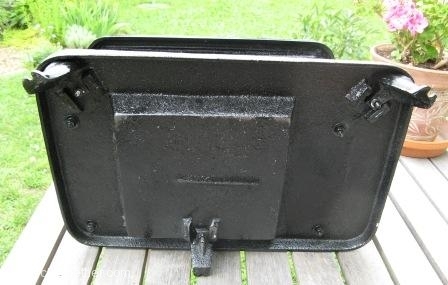 Now, for those readers keeping score, Navigator sells their raw cast iron Lunenburg Foundry (Nova Scotia) licensed version for $1385 USD, not including packaging and shipping. We ended up paying a total of $580 USD, albeit for a somewhat rougher-cast New Brunswick version sprayed in a thick black layer of high temperature paint. The only differences I can determine (aside from the rougher casting and high-temp paint) is regular steel instead of stainless steel through-bolts (Navigator sells a replacement stainless steel set for $25), regular steel instead of stainless steel hinge pins (which could be cobbled together via the bulk bins at your local hardware store), no fiddle rail (also available as a replacement part from Navigator, $65 – or, for those adventurous with a drill and some machine oil, you could make your own fiddle rail), the use of a single rectangular cover plate instead of the two round cover plates found on the Navigator version, and finally, bolted-on legs instead of Navigator’s dovetail slide-together legs. This last one is a factor of the rough casting; although the dovetails are there, they are too rough to work. So the quick and dirty solution at the factory is to drill six holes, three in the body and one in each foot, and supply the new owner with three sets of nuts and bolts. For us, stainless steel bits and a fiddle rail are unnecessary, and who cares if the casting is a little rough? Although we would have loved a red or green porcelain enameled Little Cod, we can put up with our high-temp paint, bolted-together version in exchange for paying around a third of what Navigator charges. I think its kind of cool that the contemporary Enterprise Fawcett company still even bothers to make these stoves and that they clearly use the original hundred year-old (or older) molds to do it. The customer saves big by not having to fund new R&D or having to indirectly cover the cost of royalties paid to the foundry for the rights to use the patterns. Our stove has definite character and we’re going to use the dollars we’ve saved to offset the cost of our unique method for producing hot water, which we’ll talk about in our next post – Wood Heat & Hot Water : Discovering the flue-mounted water heater. As we enter the world of tiny houses & are building our 200sqft cabin in the mountains, we have found a shortage of balanced info. 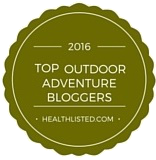 Thanks for this posting, it helps ease some uncertainty – We aren’t alone! We are using Vozelgang’s smallest wood stove, but bought it at Harbor Freight for $160 USD, which is less than half what they have on their web site. (used the 20% coupon in PM mag!) I designed my own wall thimble with an 8″ pass through for a 6″ fluepipe & placed fibergass insulation between them. I plan on replacing it with mineral wool before I finish the wall behind in fire board. I had a friend’s father give us grief for it, he thinks we will burn the place down, but the top of the outer pipe is cool enough to touch, plus we want to put in an Flue Water heater before the passthrough. This will lower the temp even more, so I’m not too worried about it. I thank you for putting the info out there! Great to hear about your “little” project! I’d love to know more about how you’ll be constructing the walls and roof. I’ve been researching a lot recently on the Building Science Corporation’s website – seems like many of the concerns they raise concerning conventionally sized homes are only multiplied in tiny houses unless adequate measures are taken to offset the potential problems. On the topic of woodstoves, one thing that we all need to consider when planning a small dwelling and using a woodstove to heat it and produce hot water is that there may exist a scenario whereby in order to get the stove hot enough (and those elevated temp.’s sustained for long enough) to produce hot water, opening several windows might actually be necessary to keep the inside of the wee house cool enough to occupy. We recently met with a local plumber who raised this concern. He ran a quick heat loss calculation that reflected a diminutive BTU requirement of ~6000BTU’s. This in contrast to our little stove which is rated up to 28,000BTU’s! Since woodstoves are their most efficient and produce the least amount of creosote when they are fired nearer their max rated output – also the best scenario for indirectly producing hot water via a flue boiler – then it will likely be mandatory for us to open windows (and maybe even the front door!) to keep the inside temps bearable while we make hot water. 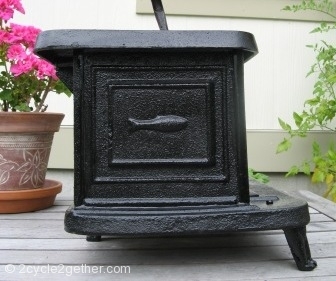 And here I’ve been worried most about whether or not the Little Cod would be enough stove for our climate! I’m so happy to find this story. I’d been looking into the marine propane stoves when I found the NSW site. I contacted the EF company and they’re still selling their version of the Little Cod for $475. I’m building a well-insulated studio in the Yukon Territory, where we often get -20 for long periods and it’s not uncommon for -30, -35. Because my studio will be small, around 12×20, the Little Cod seems a great fit. Certainly everything else on the market is for 800 sq ft and would be too much. But I can’t believe this little (has to be said, adorable) stove would be able to keep me toasty. Are you using this Little Cod in Canada? How well insulated and what size is your place? Do you load this up every 3 hours or so? A 4″ pipe seems so small. Any info at all would be so appreciated. There should be a Little Cod owners forum. Great to hear from you! As you’ve likely surmised by now from reading deeper into our site, our tiny house is not yet complete and therefore we have no real world usage data to share with you. Also, we’re located in northern Vermont, USA, so climatically we’re in Climate Zone 6 while you are in Climate Zone 8 (IECC Climate Zone Map). However, we can pass along some of what we learned during our research into heating our tiny house. We used the BTU output numbers on NSW’s site to determine the output of our EF Little Cod – we figured that the design is likely unchanged from both competing and “modern” versions. So, according to their numbers, the Little Cod puts out between 10,000 & 28,000 BTU’s. Next, with the help of a local plumber (who we visited with to get a handle on the feasibility of using a Fire Flue boiler), we determined that based upon a rough heat loss calculation, our tiny 8½’ X 22½’ building will only require approximately 6000 BTU’s of heating annually. For comparison, this is equal to roughly ¾ cord of hard wood. Getting a handle on this dashed our hopes of using the Fire Flue since it became clear that we wouldn’t need to operate the stove at anywhere near its max limit in order to heat the space. This is a problem since heating water requires a lot of BTU’s. The stove would need to be operated at full tilt to produce enough heat exhaust to heat water and doing so would force us from the house except on the coldest of days! We would recommend you contact a local heating contractor and provide them with the square footage of your building and envelope insulation scheme, particularly the estimated whole wall R-value (or at least the R-value of the walls, floor and ceiling and the number and U-value of all windows and doors) so they can perform a quick heat loss calculation to give you an idea of what size heat source you will require. I think you will be surprised (as were we) of how little heat is required to heat a small, even modestly insulated space (even in the Yukon!). As for a “Little Cod owner’s forum”, NSW does have little-utilized blog where you can go and search other people’s similar questions and/or ask questions of your own. 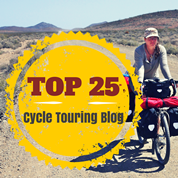 The link to the blog is on their site. You might get lucky and find someone more up your way who can provide you with some real-world usage info. Also, check some sailing blogs/user groups/discussions for more info on how often you can expect to have to stock the stove with wood. There are some folks aboard ship who claim that they can clamp the stove way down at night and still have embers in the morning – enough to kindle a new fire without the use of another match. Not likely possible in the dead of winter as far north as you are, but at least something to think about. Good luck and thanks for visiting our site! Unfortunately the foundry that made these stoves burned down this spring time. Super sad, so now aside from marinestove.com, there don’t seem to be any other sources. There are other companies that make similar products like shipmate.com whose “skippy” seems to be a competent replacement, though it doesn’t have side loading capability. Thanks for the heads-up. Very sad to hear this! I did a little research and it appears that the fire damaged the foundry’s office building but did no harm to the molding building which is where a majority of the fabrication occurs. That said, this uninsured loss is still devastating. For what its worth, Enterprise-Fawcett’s website is still alive but it mentions that the fire occurred and states that, “…the office will be temporarily closed until further notice.” It would be a great loss to North American manufacturing should this company not find a way to recover. We wish them well. I have been designing a tiny home for myself and have been looking for information on small wood stoves that can heat such a small space like mine (20Lx9W with lofts) while providing hot water for shower and dishwashing. I was considering the Four Dog’s Three Dog Stove for its cost and the optional water heating attachment. But someone wrote in a tiny house forum that TDS may not be ideal for long-term, daily operation during cold months as it is designed for use in camping. Then I found Navigator’s Little Cod and love its size and design, but the final/total price to have it shipped and installed is prohibitive. I felt defeated and came to a conclusion that I might have to resort to propane until I found your blog. I was so excited to read about Enterprise-Fawcett’s Little Cod, thinking that finally there was hope. Until I clicked on the link you provided above. Could you please share the contact number of the company in case they are still in business, just not accessible via the Internet? Much thanks. Ri – Sorry for the crushed hopes! I actually tried to email and call the company back at the end of March but received no reply. At the time the email was still working and, the website was still up and the telephone number worked (rang to voicemail). Now their website is gone and the telephone number (506-536-1160) is disconnected so I’d say its time to look elsewhere. Luckily you have options! 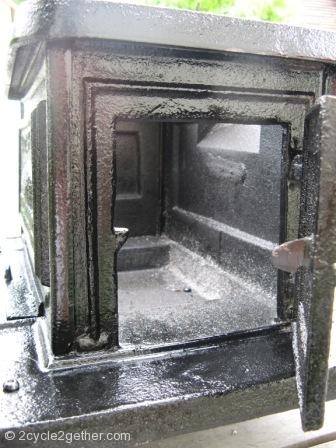 I keep an eye on the various auction/sale sites (ebay, kijiji, craigslist, backpage) and am amazed how often marine wood stoves appear, some even ultimately failing to sell(!). Start there for some great deals. Otherwise, there are also numerous options for new stoves available to you if you’re willing to look further afield, specifically in the U.K. I stumbled upon this route a few years back before I’d located Enterprise-Fawcett and prior to availability in the US. As might be expected there’s a long history of tiny wood stove production in the UK (and in some of the countries now part of the EU) that’s supplied generations of ocean going vessels, narrow boats (canal boats) and homeowners alike. Google “2.5kW”, “3kW” and “4kW” and “wood stove” and start inquiring which of the various manufactures/retailers are willing to ship to the US. The nice thing is that many of the UK manufacturers offer water heating options (back boilers or flue boilers) and other features (ultra high efficiency combustion, etc.) as standard or as optional equipment. Sad to hear about the foundry fire. Hello, I am writing to you, from Kelowna, British columbia, Canada. i am so impressed with your website and want to majorly thank you for you “Little Cod” info!!! we have an old rusty version of “Little Cod” and would like a newer one but like you don’t want to pay the outrageous fee for a new one. I would like to know how you got that stove shipped to where you are and was there much trouble talking the folks that you bought it from to send you one? ours would only have to be shipped a few provinces over for us. Please email me with the phone # for the enterprise Fawcett manufacturing company. Again, love your site and appreciate the info. Thanks sooo sosoo much as we are faily poor and we would like to heat our RV. Andrew – So great to hear from you! Now, for the record, we love your products and had we been able to afford your Little Cod that’s what we’d own (what we would have done for an enameled version!). Likewise, we are huge supporters of domestic manufacturing and the last thing we would ever advocate for is someone seeking out a sweatshop product (or a manufacturer shipping production to a country lacking labor and environmental protections at least comparable to those that we take for granted in the United States). You should also know that we send folks your way all of the time but at the same time we also reserve the right to suggest alternate options to folks when money is tight. Luckily, for us at the time we purchased there was an option that better met our needs. Sadly, that option is no longer available. And while you may be right that Enterprise wasn’t covering their costs vis-a-vis their production of Little Cod’s (FWIW in the end they were pretty much made to order) the fact remains that it was a great option while it lasted. So, you don’t need to apologize to us or anyone else for the realities of your livelihood. We support what you do every chance we get! Finally, we also wholeheartedly encourage folks who are so impassioned to consider following in Andrew’s footsteps (and Lunenburg Foundry’s, etc., before his). That would be a fantastic legacy! Thanks Andrew!